Yikes! I'd better get my Christmas post up before the new year begins. You'd think with Tyson taking two weeks off (yes we really were that lucky) that I would have plenty of time to blog. But I'd rather spend time with him. Anyway, we had another wonderful Christmas. 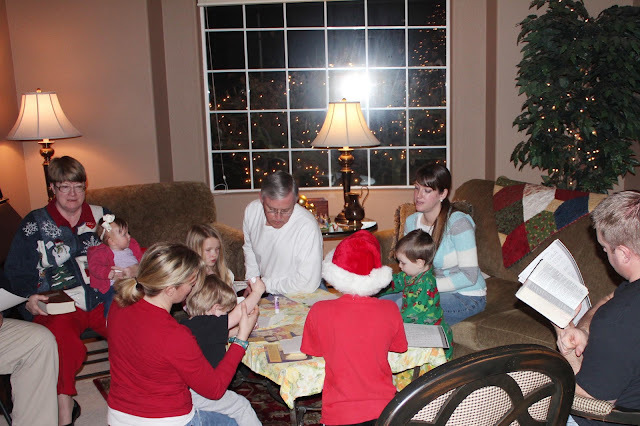 We spend Christmas Eve at the Lowder home where we ate scones and did an interactive version of the Christmas story which included singing and gluing pictures for the kids. Christmas morning we woke up around our usual 7:30 and although Logan may have been confused by the change in routine, he fed off our excitement and got into it. I believe I look appropriately tired/disheveled for Christmas morning. After looking through our stockings we went to the kitchen and had a delicious breakfast of Costco cinnamon rolls, chocolate milk, and orange juice (easiest Christmas breakfast I ever didn't make). And I think Logan had some cold cereal. He is a child of habit. Breakfast didn't last too long though because A. I wanted to open some presents, and B. we had church at 11 that we were gonna have to get ready for at some point. 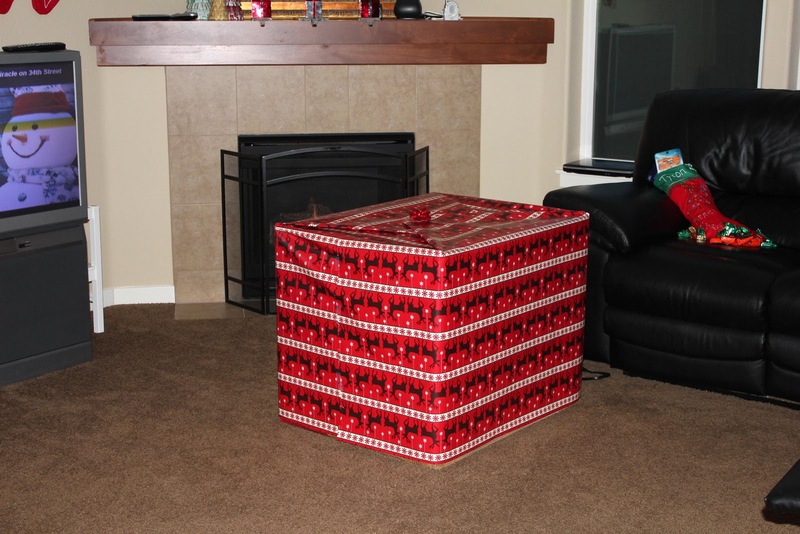 Also, I wanted Tyson to open the biggest present I ever wrapped. Not to ruin the suspense for you guys but it was a grill. And he loved it. Wife points! 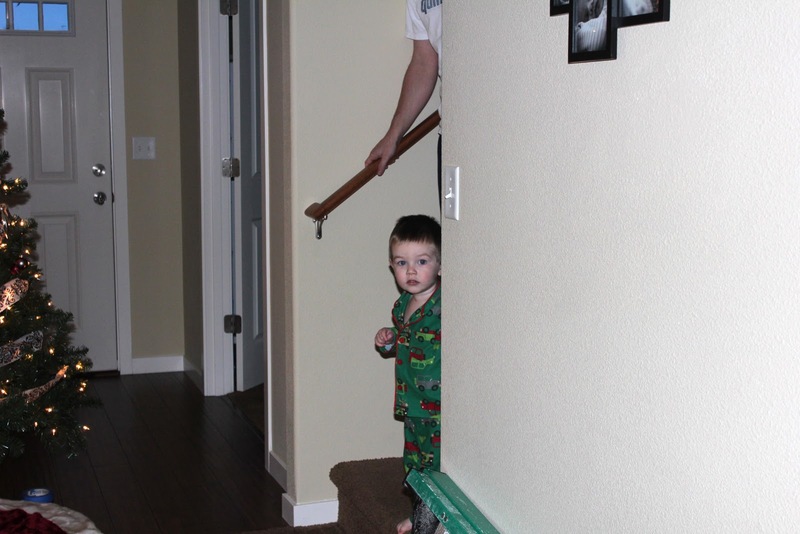 Logan was also thrilled with his Thomas pillow pet, a toy I didn't understand the appeal of until Logan wanted one. Then it didn't matter what I thought because it was Christmas and if he wanted it that bad, then by golly he was gonna get it. 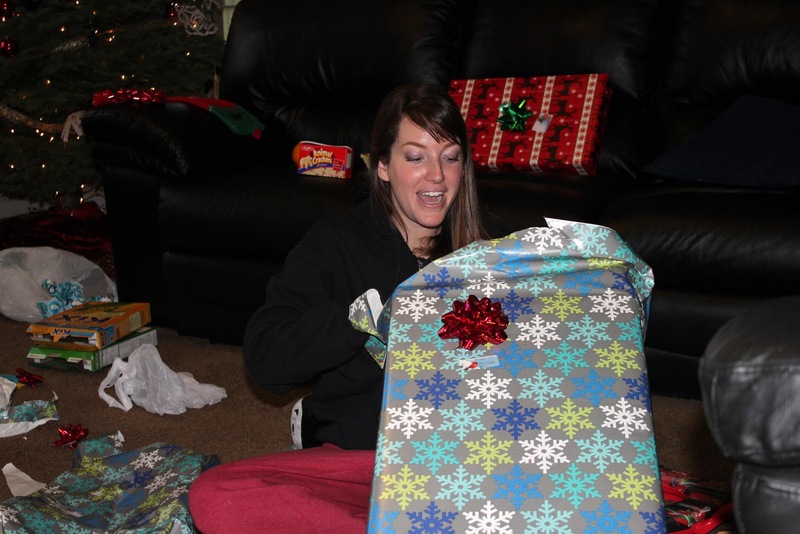 The annual gift of the nerf gun was also popular. And here is my "yaaaaaayyyyI'mgratefulbecauseit'sChristmasbutwhatisthis" face that occasionally shows up Christmas morning. It took me a minute to figure it out because the actual present was wrapped in some of our towels and for a minute I thought I was getting new towels but in the same color I had been trying to get rid of for the last three years. And that would have been a bummer. But never fear! Tyson would not do that to me. It was a porcelain pitcher that I had been coveting from Target. After a joyous time of gift giving and skyping with my family we went to church which was awesome. It definitely made me wish we had Christmas on Sunday every year. 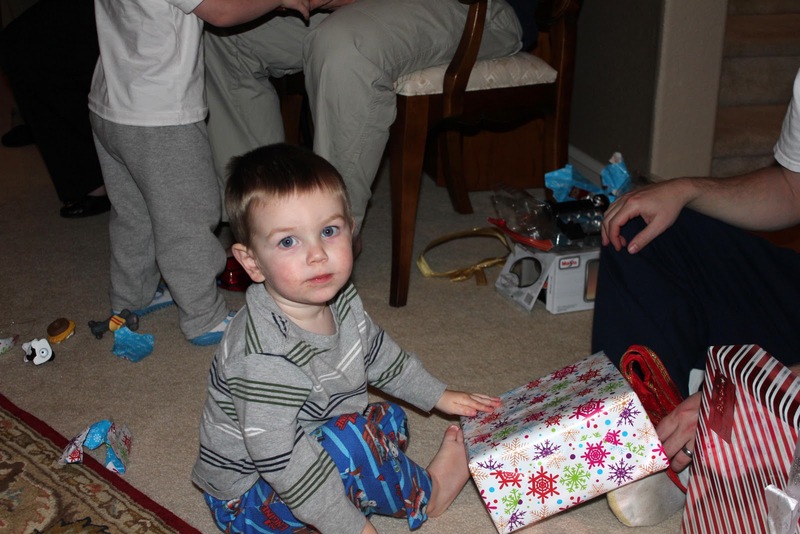 Then we came home, took Christmas naps, and headed back to the Lowder's for Christmas dinner and some more gift giving. I only took about 3 pictures and they were pretty much all like this. Goal for next year: photographically document our lives better. Especially since I got a new point and shoot camera that fits in my purse. No excuses! And that was our Christmas! We've been keeping busy over our break with a home improvement project which I can't wait to show you, but will have to wait until it's done. Because I love a big reveal.